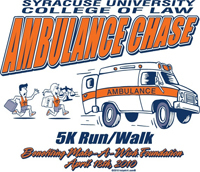 Some charity runs begin with a shotgun, but the Syracuse University College of Law Ambulance Chase starts with the blaring sounds of ambulance sirens. Law students are once again organizing the lively Ambulance Chase to benefit the Make-A-Wish Foundation® of Central New York. The 5K walk/run begins at the College of Law patio at 10:30 a.m. on Sunday, April 18. The event is open to the public. Advance registration is through April 16 at the College of Law. Advance registration is $10 for SU students and $15 for SU faculty, staff and the general public. Registration on April 18 is $15 for SU students and $20 for SU faculty and staff and the general public. Participants may pay in cash or by check, which should be made out to Make-A-Wish Foundation of Central New York. For more information, contact Witmer at lawitmer@syr.edu or visit the College of Law website at http://law.syr.edu.